Bell's Brewery, Part 2: Third Coast and HopSlam Ale, Ep. 49 | Beer America TV - Craft Beer in Motion! Beer America TV unleashes part two of a two-part series discussing Bell’s Brewery. 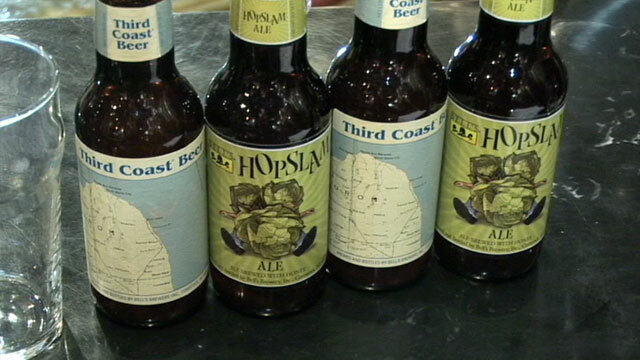 This time it’s all about the hops with HopSlam Ale and the smoothness of their Third Coast Old Ale. More fine examples as to why you should try the beer from Bell’s Brewery if you can get your hands on it. Enjoyed the Bell’s series. Have been watching for a while now. Keep the techie, geek stuff coming. Would like to hear and know more from Jon’s expertise and knowledge. Some series or tastings comparing or defining styles of beers would be interesting, especially with Jon’s palate and knowledge. Keep up the great work! Thanks Anthony, We appreciate you watching!! John is a wealth of knowledge and that’s why I asked him to be a part of Beer America TV. We try to entertain, but we also strive to teach what American Craft beer is all about. Got any suggestions for beer we should try? I agree with Anthony I like the idea of kind of talking about the differences of different styles of beers. Like pick one company and try a few styles and educate the mass on what the differences are. Keep everything up cause you choose some great beers to try. HopSlam is limited but it is distributed in all their markets. Georgia will be getting it for sure. Paul – I think it would be cool to have some Moon River brews on the show. Some might feel that is a conflict of interest for Jon to be using his own beers, but I feel he would be able to give more insight on how different ingredients, brewing techniques, and other factors affect the taste, color, texture, and other characteristics of the beer. Since it is his own brew, he’ll know exactly what is going on, and with you as the “novice,” you could see if you pick up on the subtleties. Other ideas would be to compare oaked versions of beer with their non-oaked versions, 60 minute vs 90 and 120 minute Dogfish and how they don’t just get more bitter and why that is the case. For styles of beer, any style really. IPAs – what are the flavor/aroma characteristics of certain hop varieties. Porters – different malt characteristics. The list and possibilities are endless, but what I guess I’m trying to say is I like the idea of the show having a theme or a specific topic. It could be a certain brewery or a certain style for the entire episode or couple of episodes. If there were more of Jon’s expertise and brewing knowledge (beer-geek info), I feel that would separate you guys from all the other beer tasting video blogs online. Jon could be the Gary Vanyerchuck of the beer world. Serious industry knowledge and expertise, while still being entertaining. Sorry for the long post. Again, thanks for the great vids. Paul, I wanted to give you props as well. In my last comment post I was all about John and didn’t show you much love except for the “novice” reference. I like what you bring to the table as well. As the “novice,” you bring passion, good questions, and comments that I, an even bigger newcomer to craft beer than yourself, can appreciate. This makes for a good dynamic between you and Jon. Also, your experience with film and editing adds to the production value of the videos, which can further separate BeerAmerica.tv from the other video bloggers. I wish you all the best. You’ve got to do the Bavarian pour on all of Bell’s beers to integrate the yeast… gently pour the beer until there’s a 1/5 inch left in the bottom, give it a real brisk swirl and pour in. It’s also weird to me to get Bell’s brews on draft and it pours clear. Kinda freaks me out. I love the opening joke by Paul!